Slope is a highly wearable, everyday beanie featuring an oversized cable that journeys across the body flanked both by stockinette and single rib stitches. It is an enjoyable knit which offers comfort and detail. Written with the entire family in mind, this pattern includes 8 sizes ranging from doll size (10-12”) to extra slouchy (24+”). This ribbed hat gradually transforms into a combined effect of stockinette and ribbed texture showcasing the large cable. Slope is flattering, eye-catching, and most importantly it is extremely comfortable. 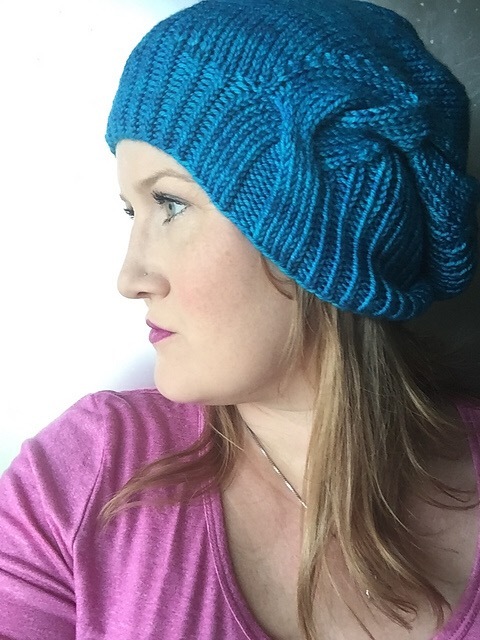 Wear with the brim pulled down snug, rolled up in the back, or any other way you please! Wherever you may be, this hat will keep you cozy, covered, and pleasantly warm! Slope has a unique construction that is both engaging and yet easy to knit in public. I was captivated by this design and worked up matching doll and child hats. They were excellent on the go projects, accompanying me to appointments, family events, and music lessons. My children, ages 5-11, have all claimed the child size Slope and while it fits each of them differently, it is gorgeously forgiving due to the ribbing. I know that I will knit many more of these hats as gifts along with the yet unreleased companion designs. Visit the ravelry pattern page for more details and follow Megan&apos;s facebook page Designs by Love, Me Etc. to keep up to date with her new releases!